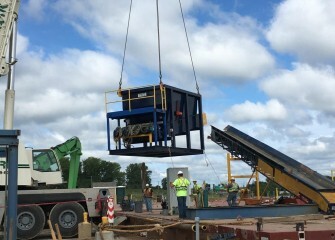 Home » Gallery "Lakeshore Activities"
August 2016 - A booster pump is removed from a barge after hydraulic capping concludes. 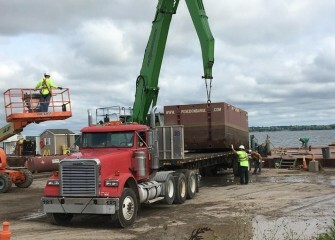 August 2016 - Barges are disassembled as work wraps up in various sections of the lake. 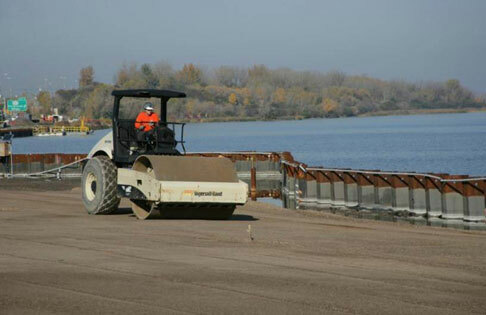 Capping continues in the southwest area of the lake. 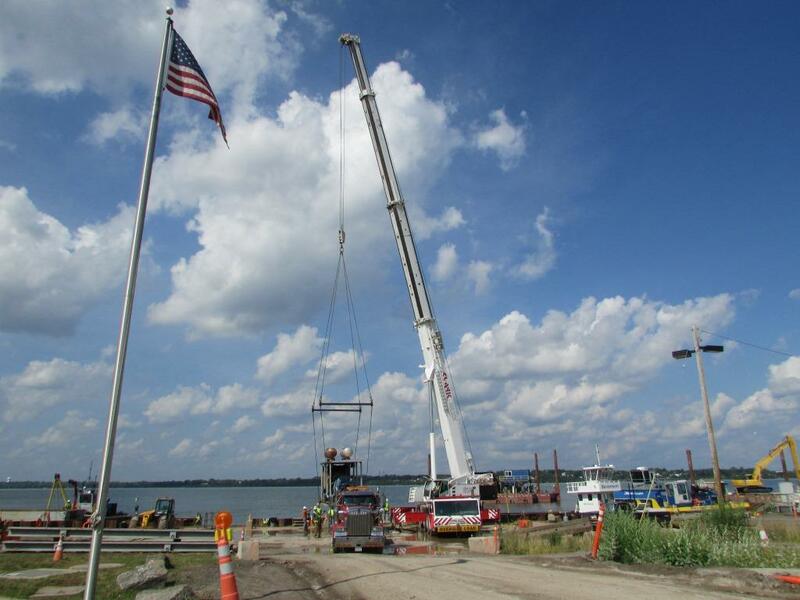 August 2016 - A support boat no longer needed in operations is removed from Onondaga Lake. 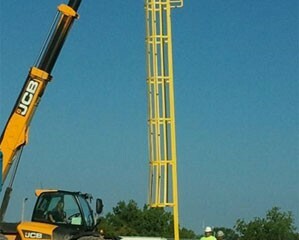 August 2016 - A section of the telestacker is hoisted off a barge. 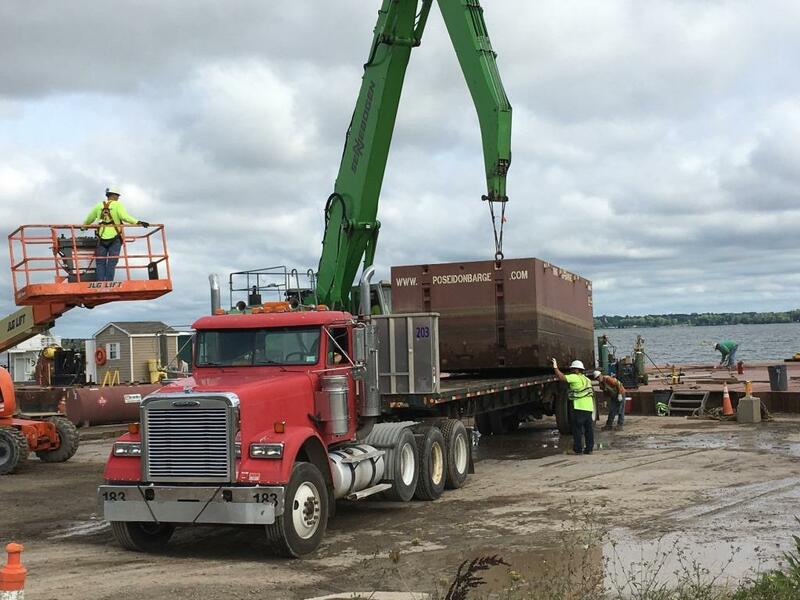 August 2016 - Sections of barges no longer needed are transported by flatbed truck. 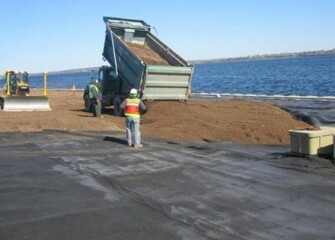 Shallow area capping continues. 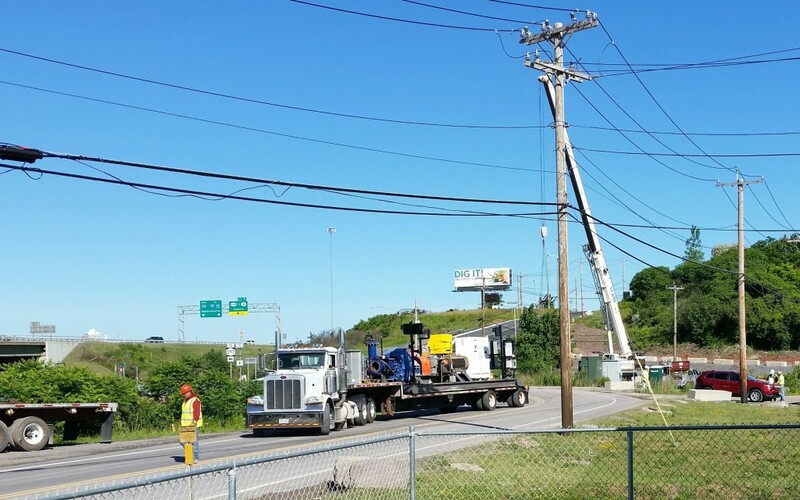 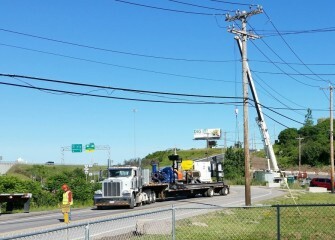 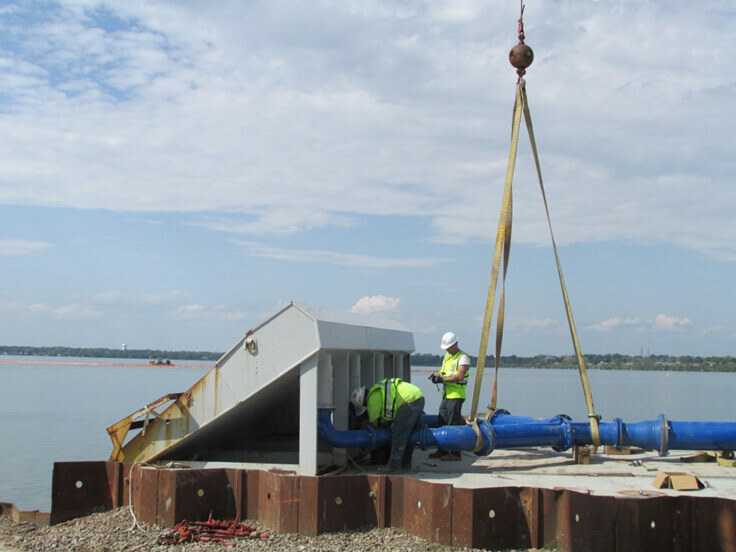 June 2016 - A booster pump part of the pipeline system used in dredging is loaded for transport to another project. 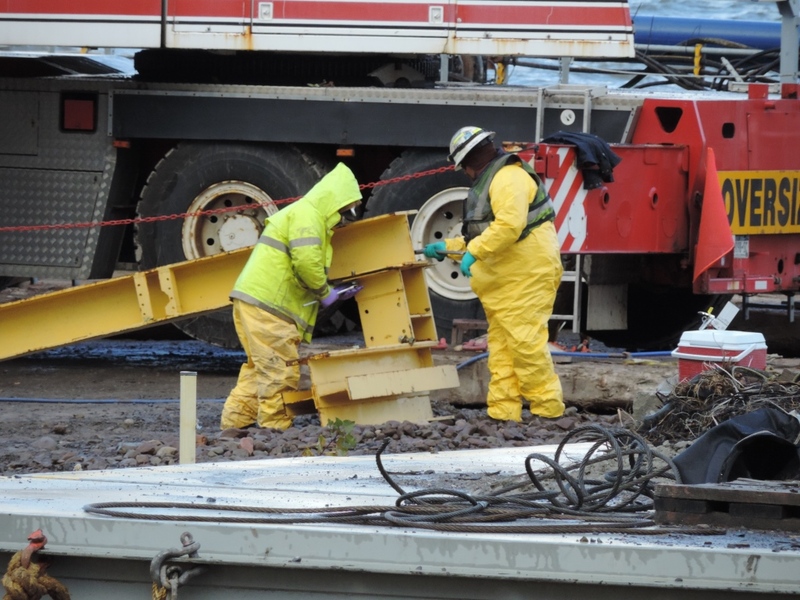 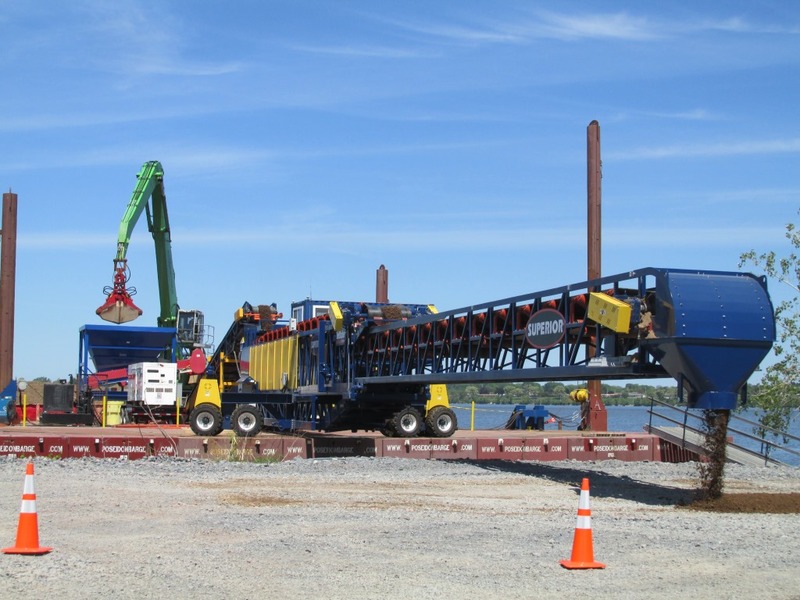 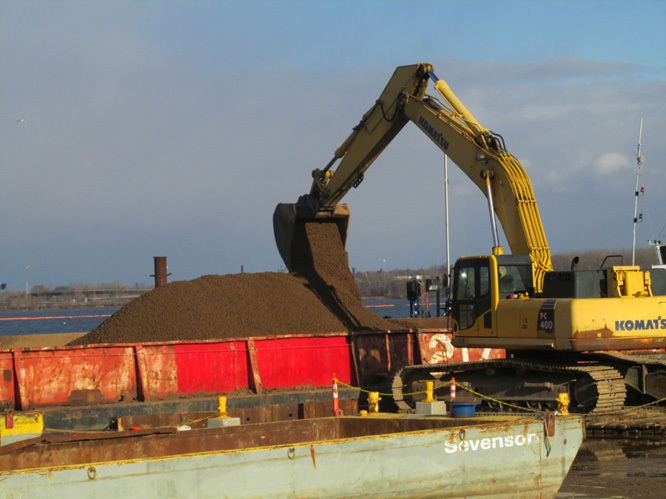 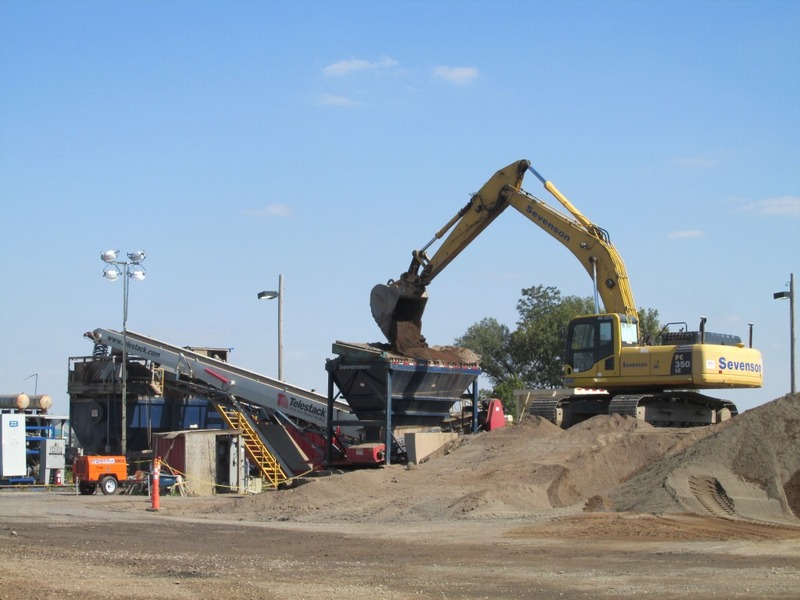 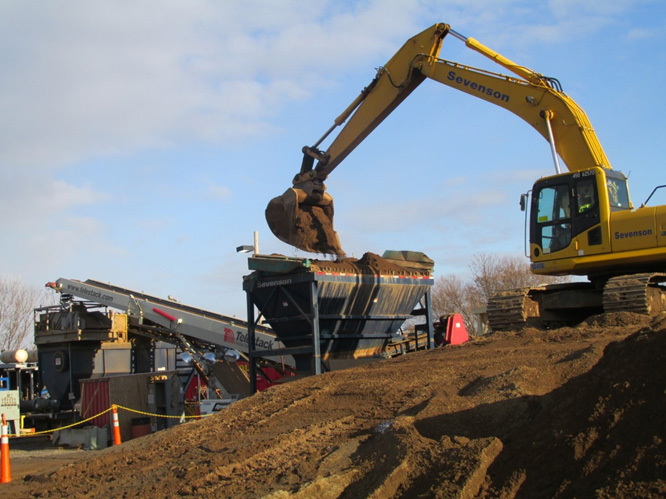 November 2015 - Coarse gravel is loaded on a barge for mechanical capping. 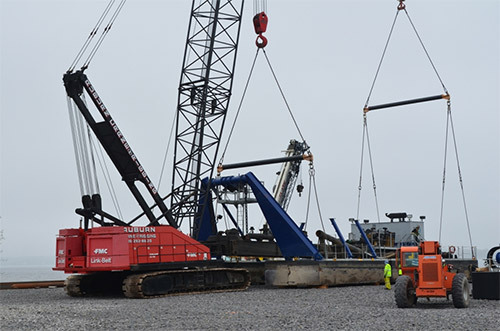 Capping operations will continue as late as possible in the fall and resume in spring 2016. 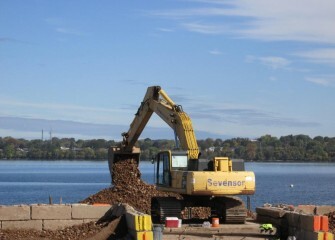 October 2015 - Barges are loaded with stone for placement in the lake. 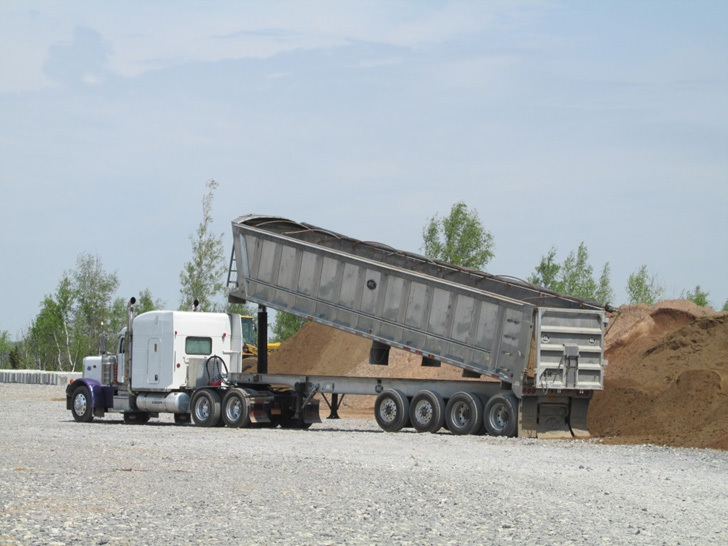 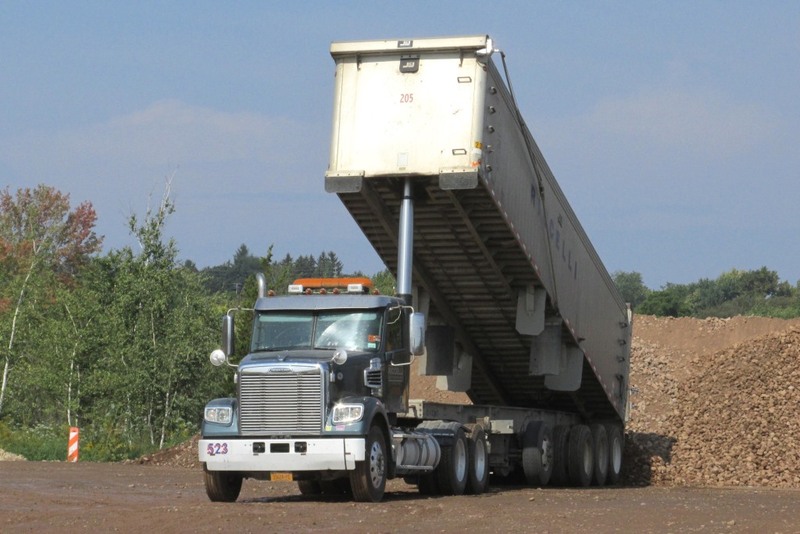 September 2015 - A load of coarse gravel arrives to a capping support area. 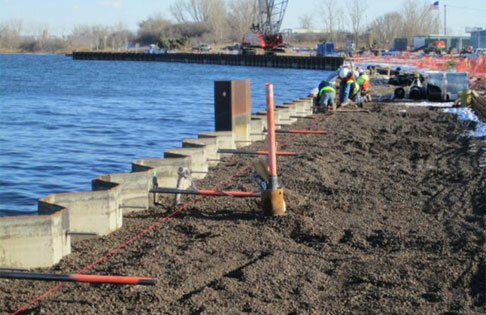 September 2015 - The volume of capping material that will be placed in the lake during the cleanup is equivalent to almost one square mile standing one yard high. 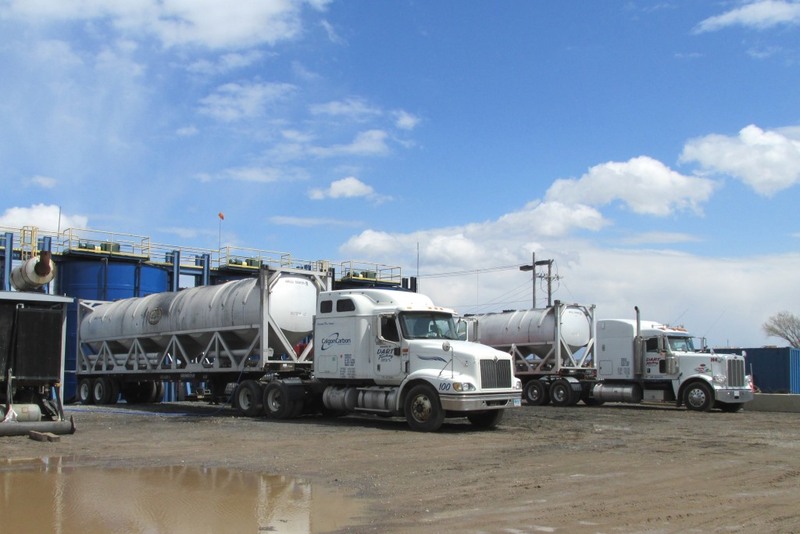 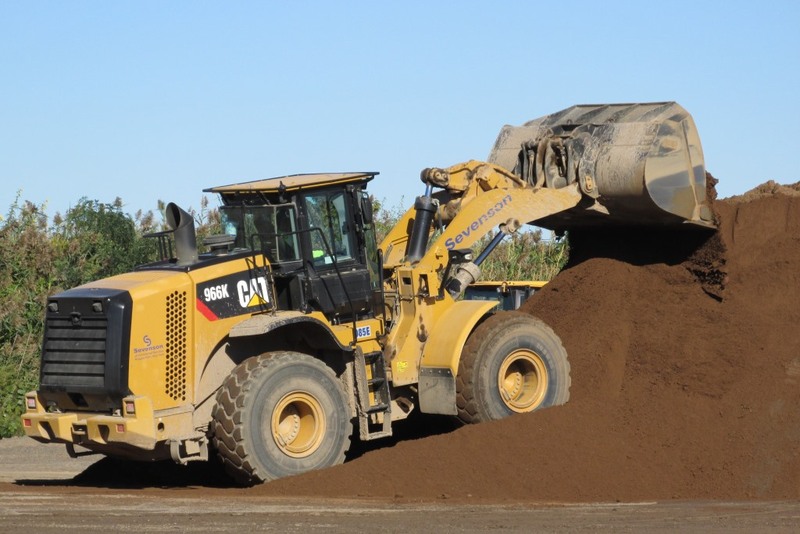 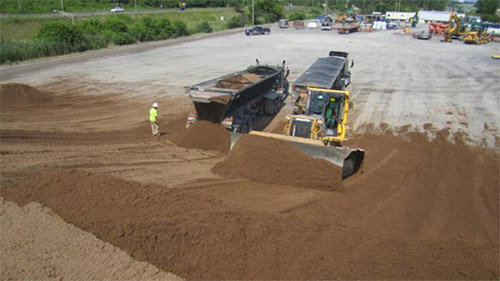 September 2015 - Capping material is regularly moved where it is needed. 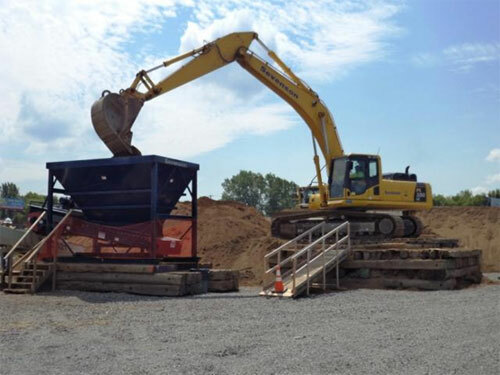 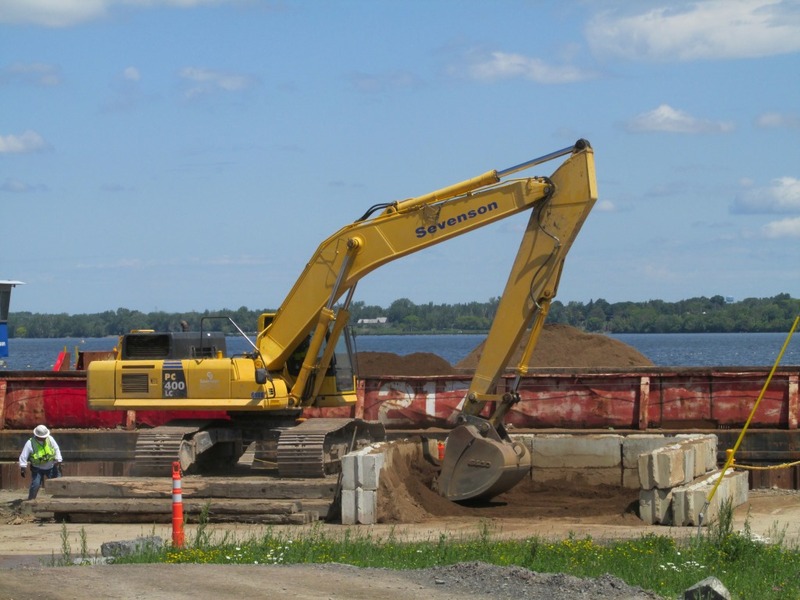 More than 2.8 million cubic yards of cap material will be placed in Onondaga Lake. 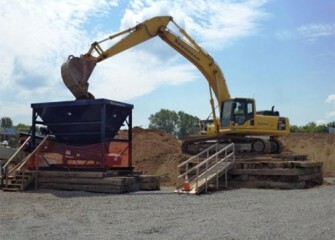 September 2015 - Sand is loaded into a hopper. The sand will travel up the conveyor and into a tank where it will be mixed with water for hydraulic capping. 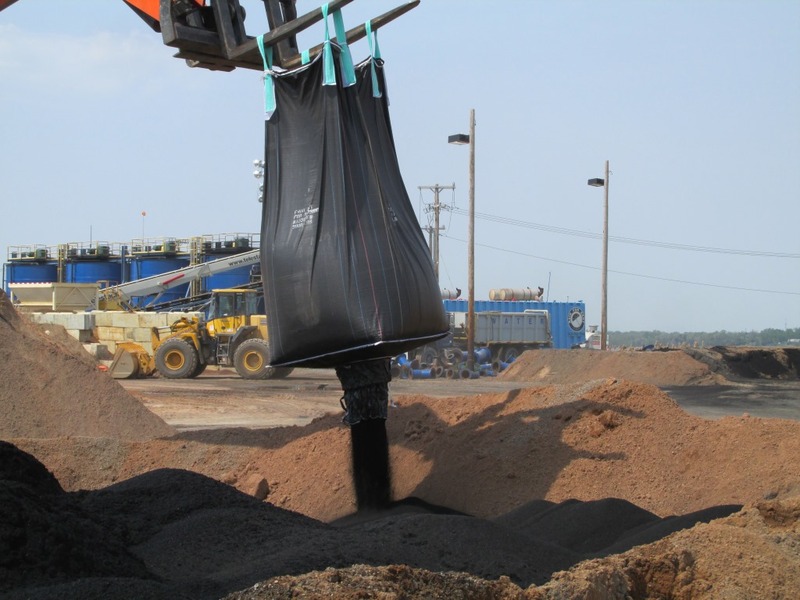 May 2015 - Granulated activated carbon is mixed with sand to make capping material for the isolation layer. 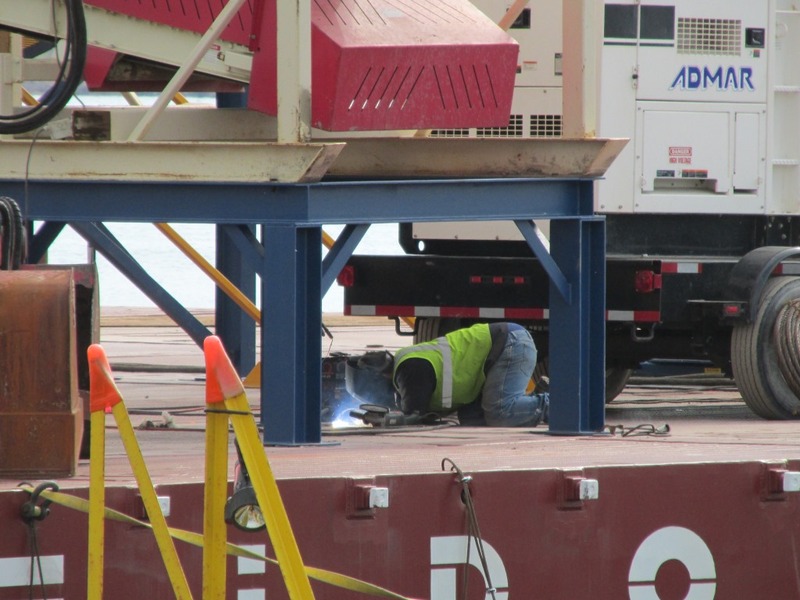 May 2015 - A welder works on an additional barge being assembled for capping operations. 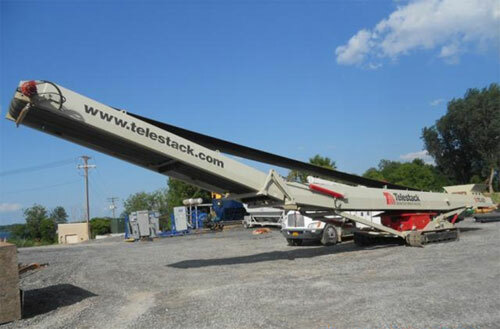 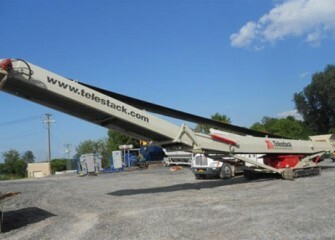 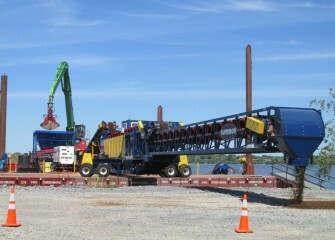 May 2015 - The telescoping radial stacking conveyor, or telestacker, is calibrated on shore before it is used in capping operations. 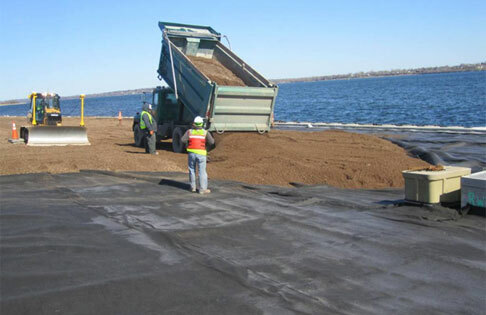 April 2015 - Granulated activated carbon used in capping is delivered to the main capping support area. 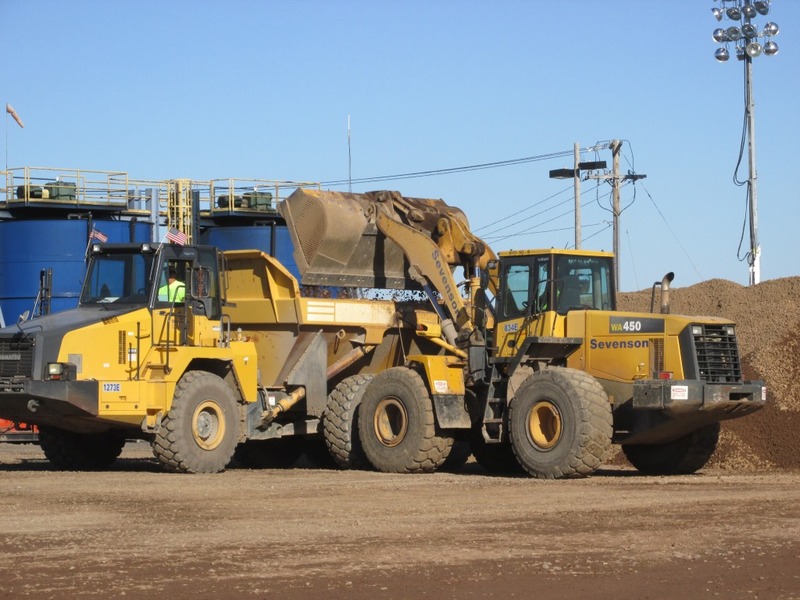 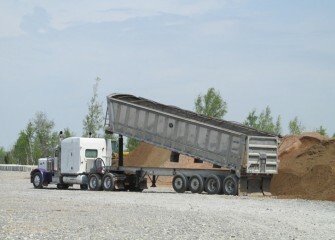 April 2015 - Sand is loaded into a hopper before travelling up a weigh belt, a conveyor belt that measures the quantity of material. 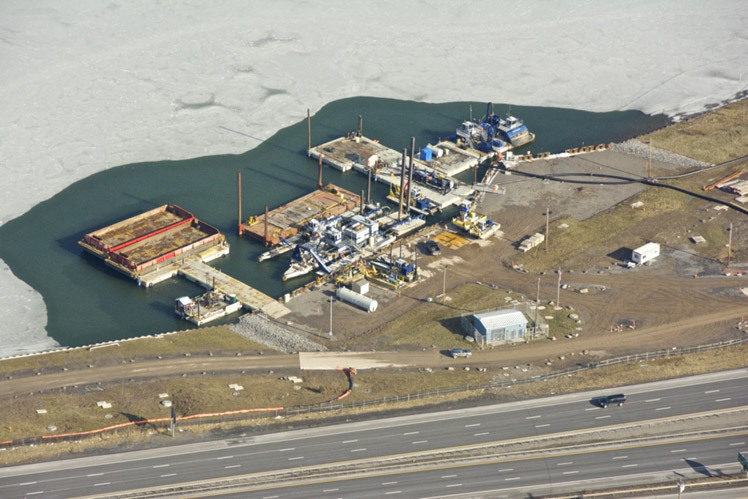 November 2014 - Barges are disassembled and equipment winterized for storage at the end of the construction season. 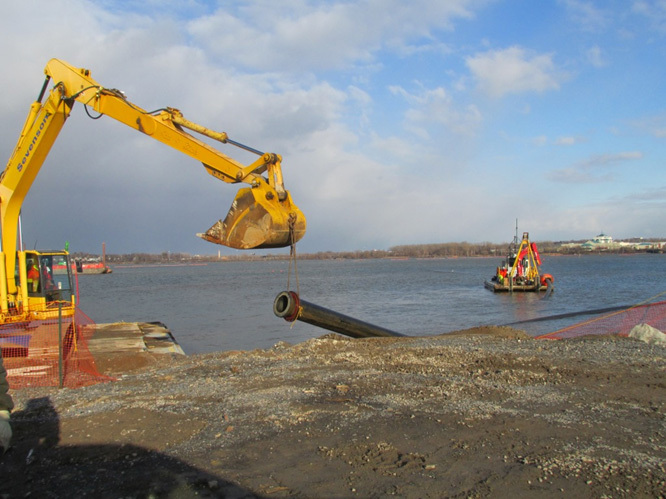 November 2014 - The pipeline used to transport dredged material is disassembled after completion of dredging on November 3. 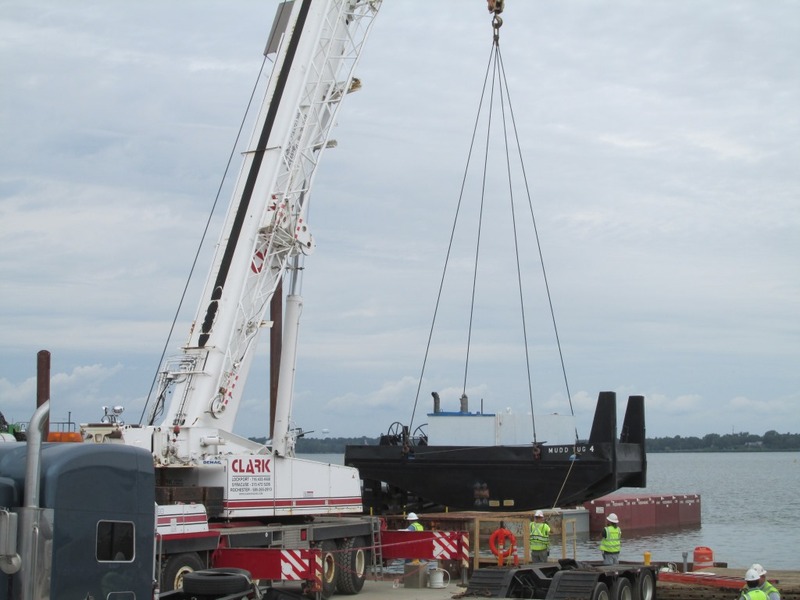 July 2014 - A hydraulic truck crane is used to lift a section of a tug boat into the water. 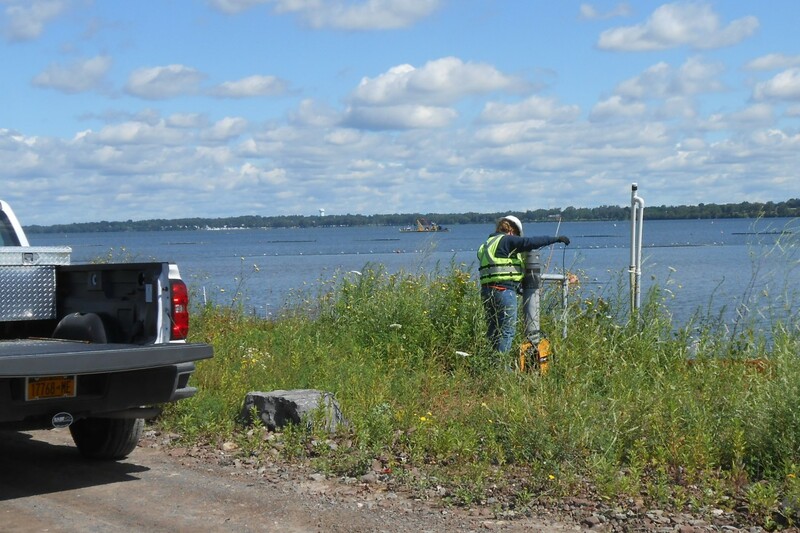 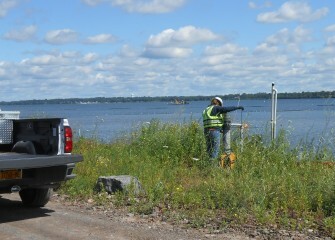 July 2014 - A worker uses an inclinometer to measure the slope of the underground barrier wall as part of regular monitoring. 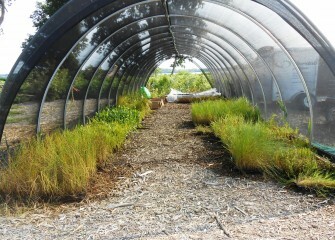 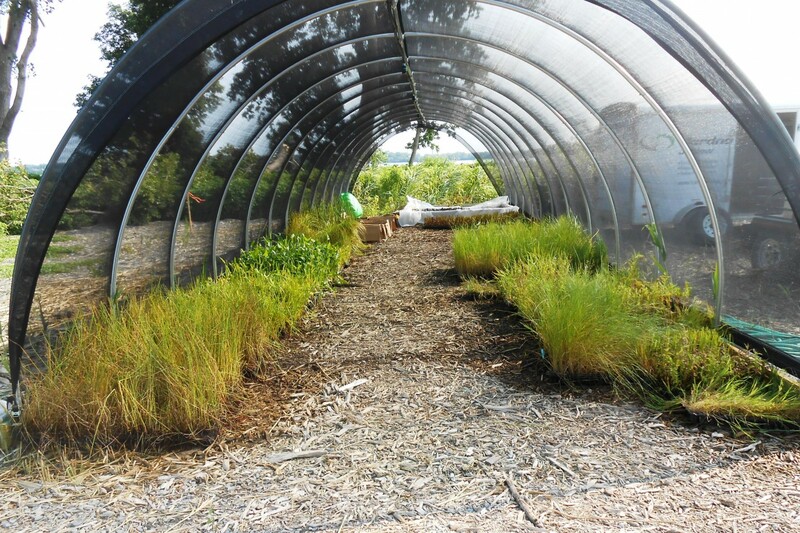 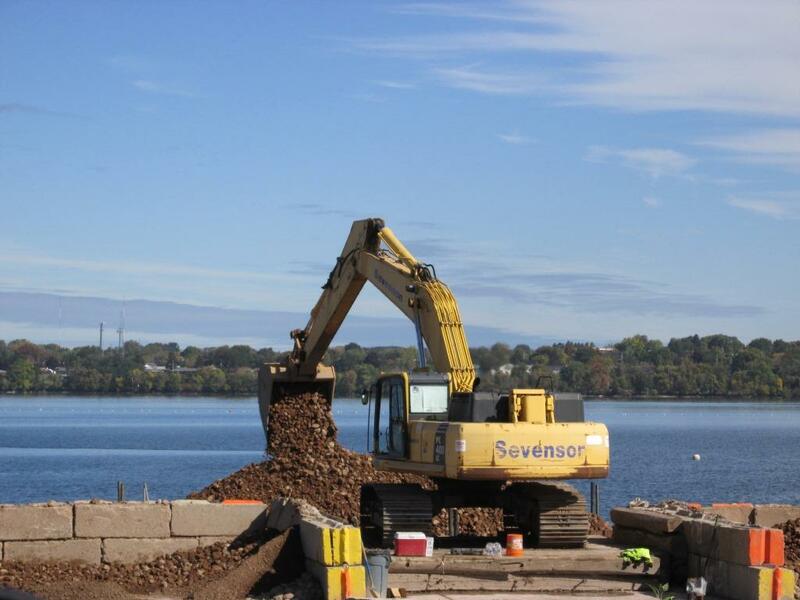 July 2014 - The first order of native plants for re-created habitat along the Onondaga Lake shoreline arrive. 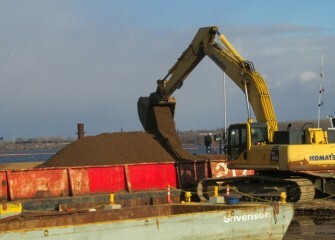 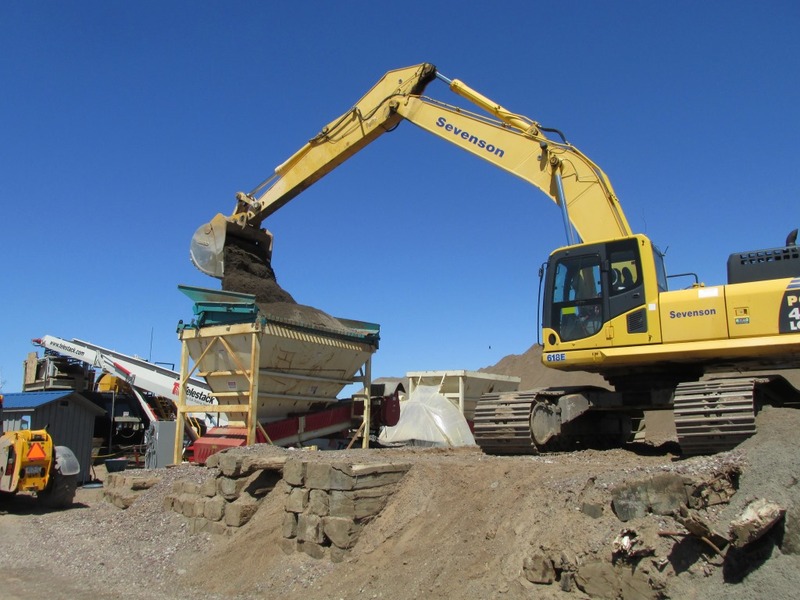 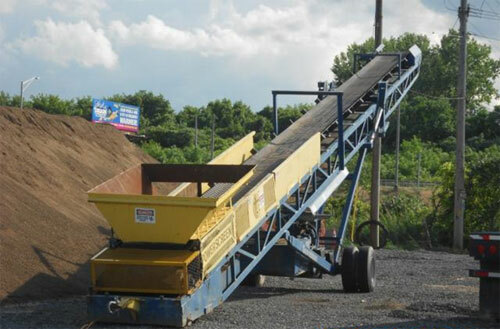 June 2014 - A barge is loaded with a mixture of sand and siderite to be placed near the mouth of Harbor Brook. Siderite is a mineral containing iron. 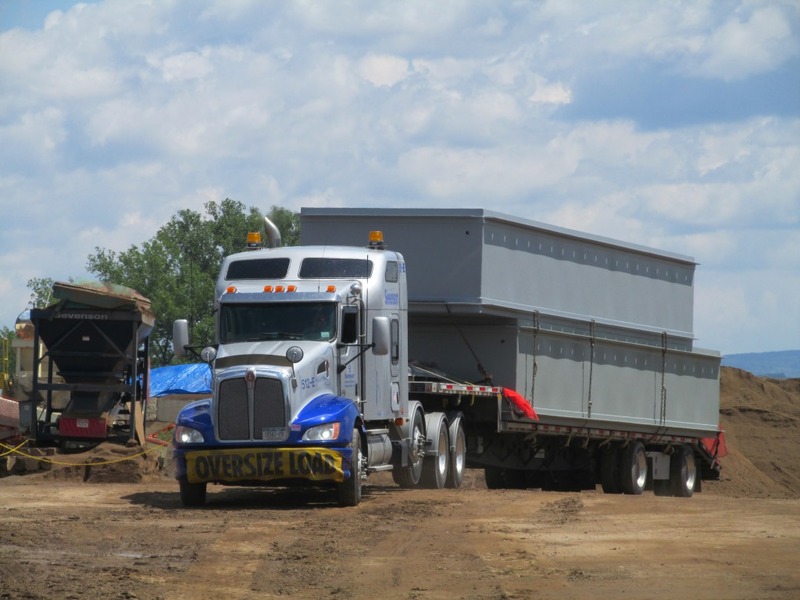 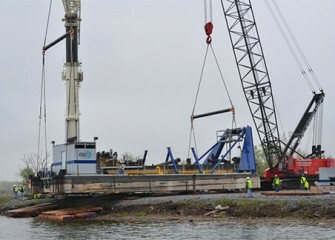 June 2014 - Sections for an additional capping barge to be built arrive. 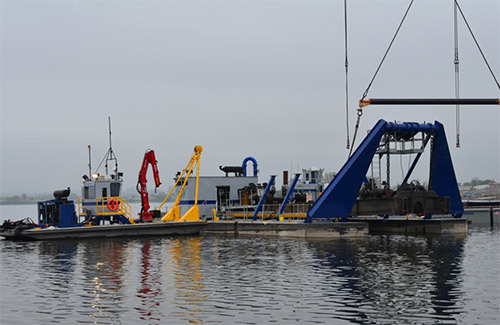 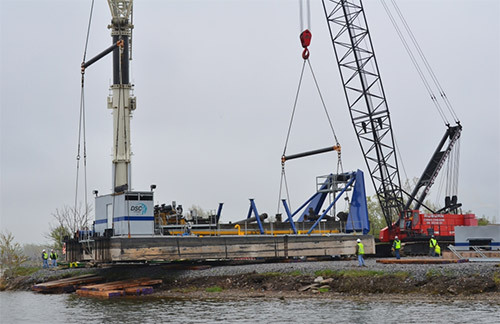 May 2014 - Assembly begins on a third hydraulic capping barge. 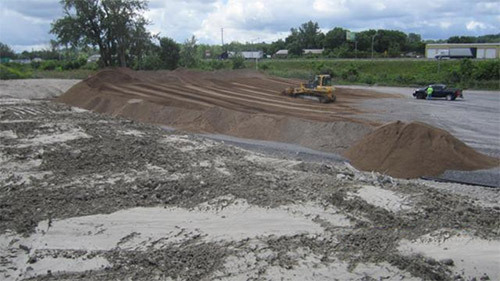 May 2014 - Sand is stockpiled for capping the lake bottom. 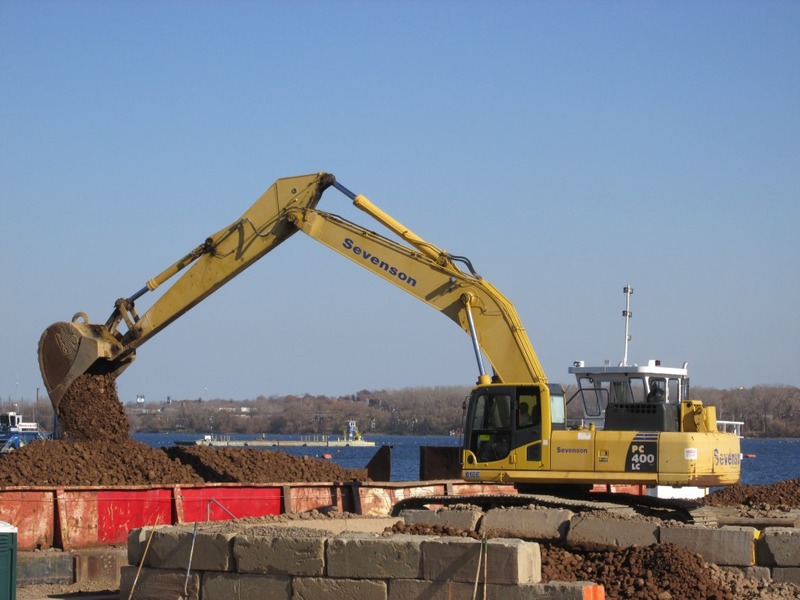 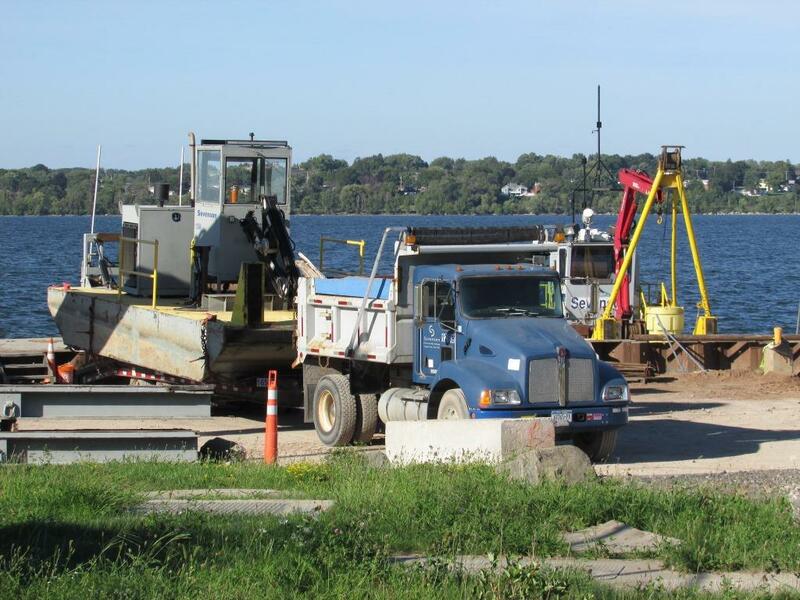 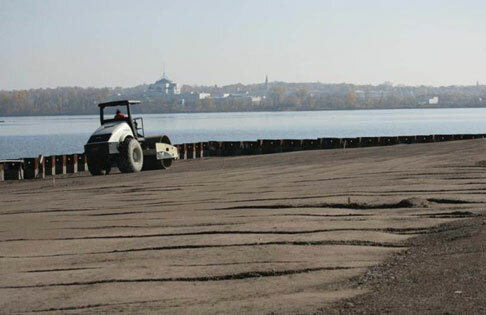 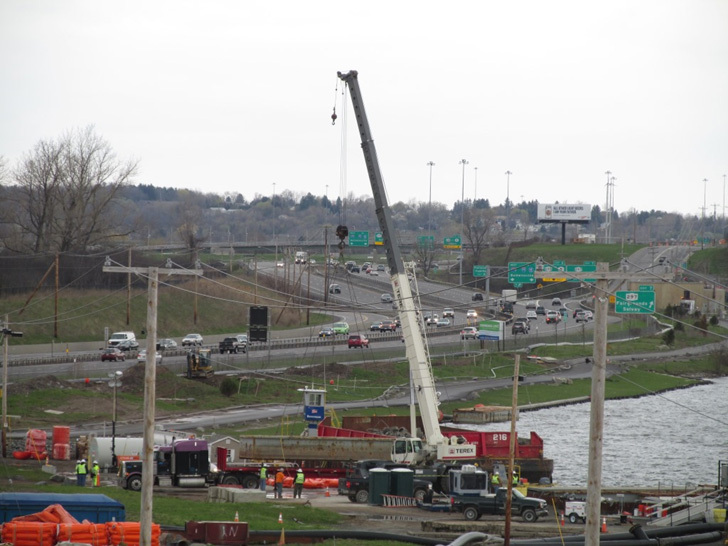 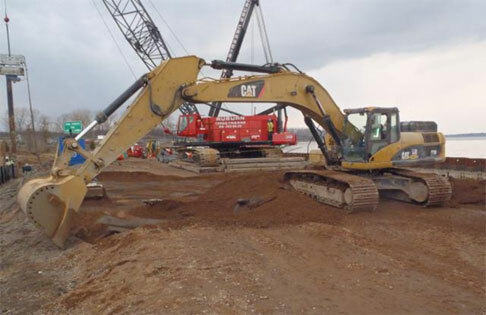 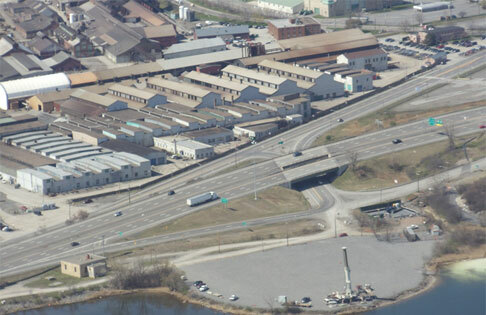 May 2014 - Much of the cleanup work on Onondaga Lake takes place close to I-690. 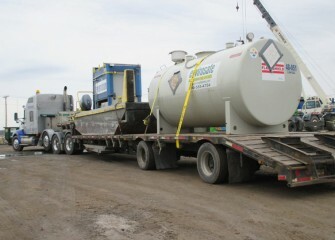 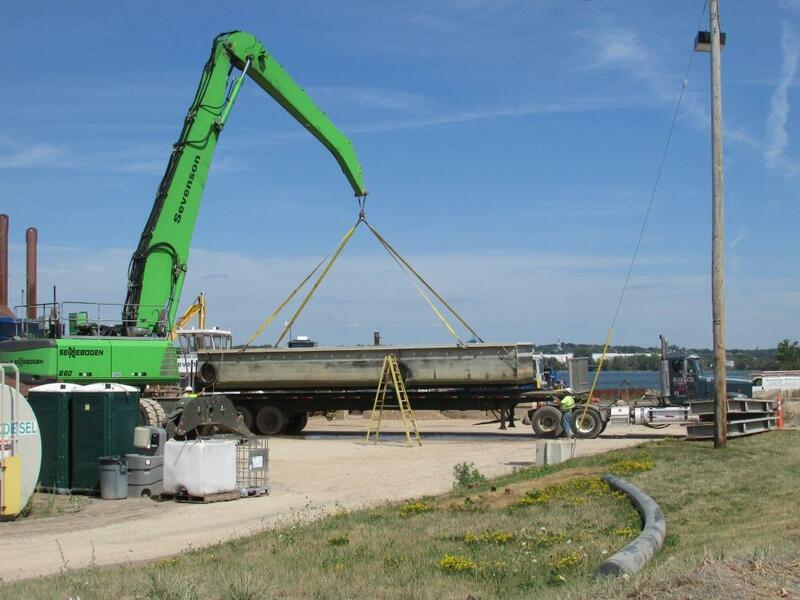 April 2014 - A boat to assist in lake operations and a tank to store biodiesel fuel arrive on a flatbed trailer. 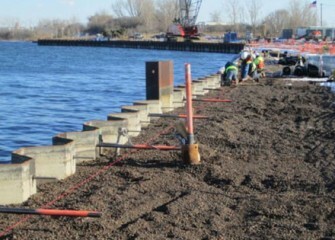 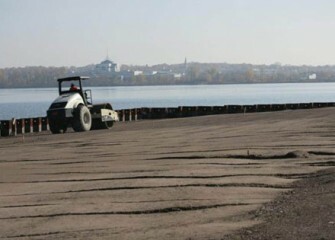 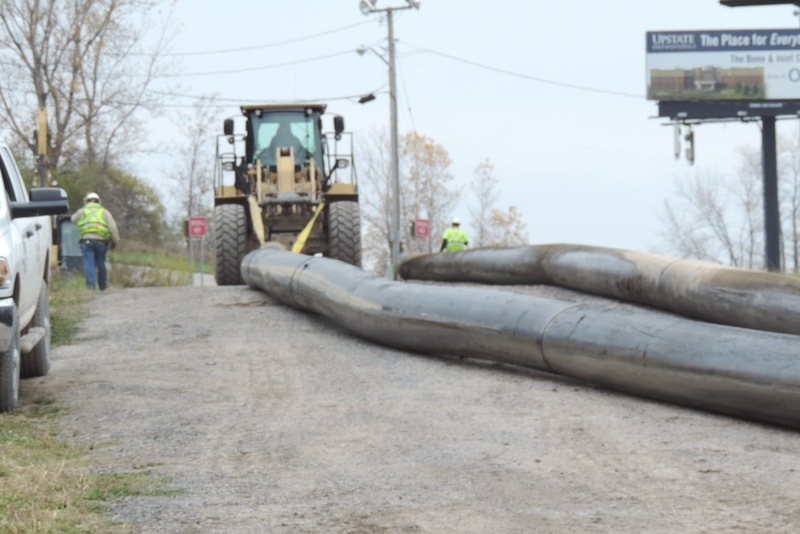 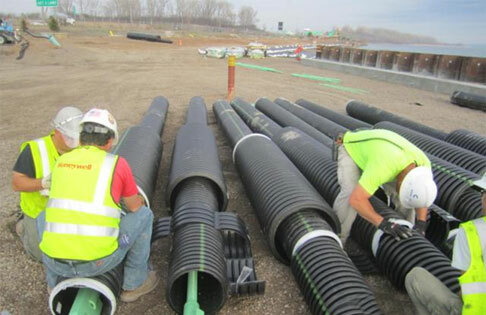 April 2014 - Pipe used in capping operations is lined along the shore before placing in the lake. 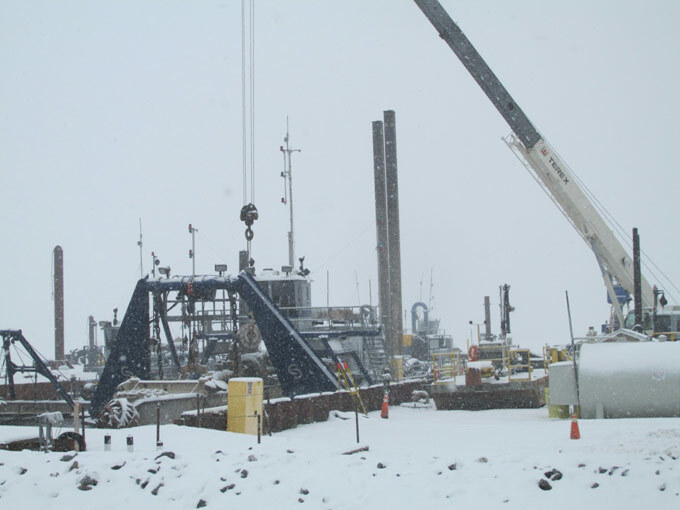 February 2014 - Maintenance continues on the dredges during the coldest months. 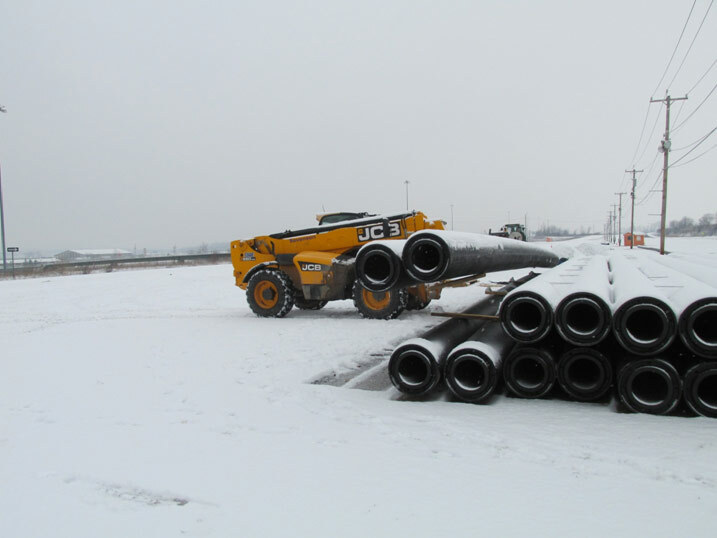 January 2014 - New sections of double-walled pipe, manufactured locally, are stockpiled before welding. 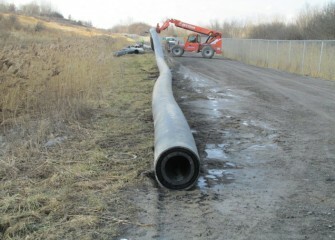 January 2014 - A new section of pipeline is moved into place. 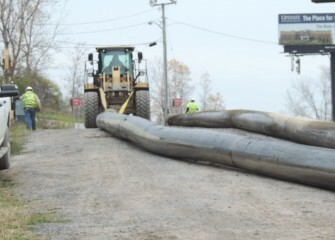 The pipeline will be tested with water before lake material is transported through it. 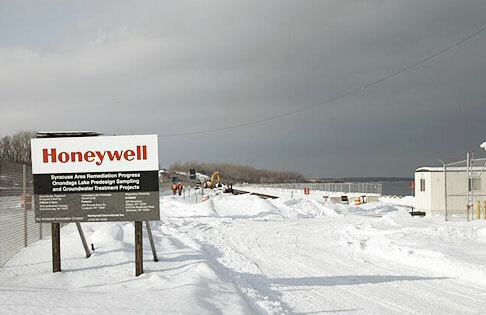 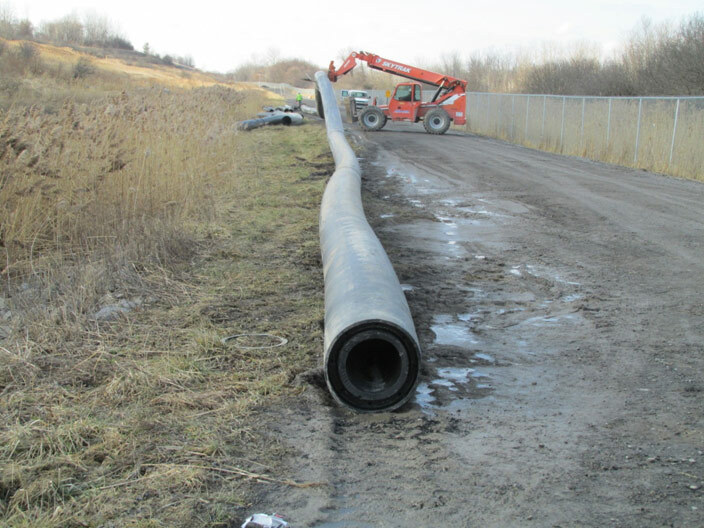 December 2013 - A pipe is removed as work on the lake concludes for the season. 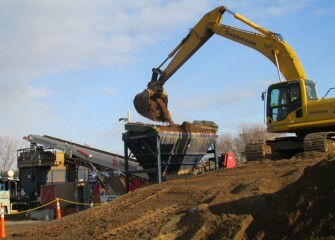 December 2013 - Sand is placed into a hopper before traveling up a conveyor where it is weighed and sent into a tank to mix with other cap material. 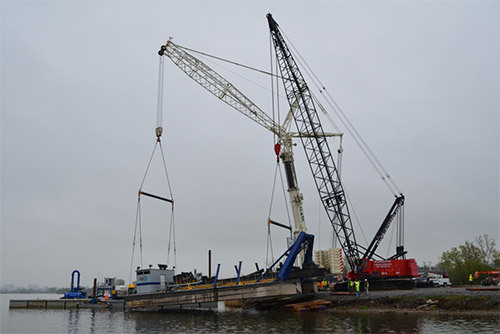 December 2013 - Capping material is loaded into a barge for placement during the final weeks of 2013 capping operations. 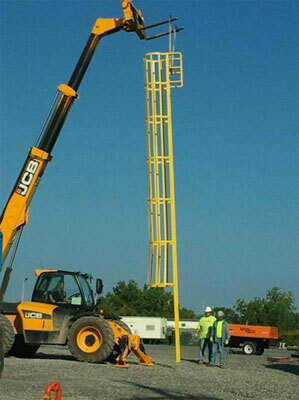 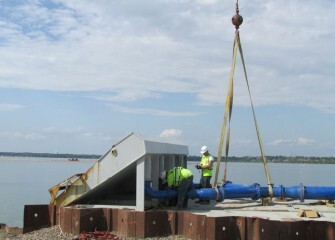 August 2012 - An enclosed ladder to attach to a carbon mixing tank. August 2012 - An excavator feeds sand into a hopper. 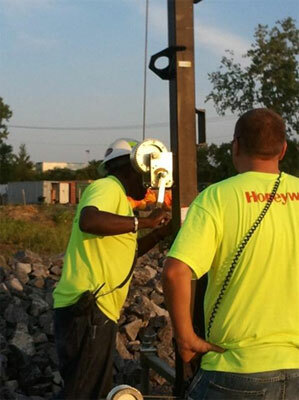 August 2012 - Workers set up lighting equipment for night operations. August 2012 - Equipment is loaded onto a support boat at sundown. 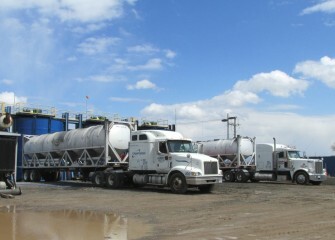 July 2012 - Capping material is delivered throughout the day. 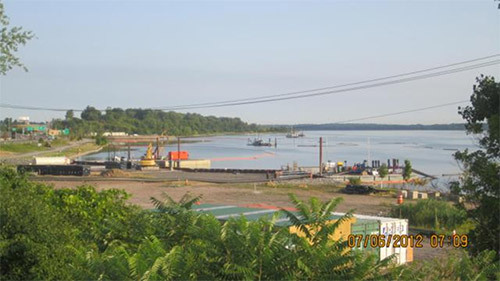 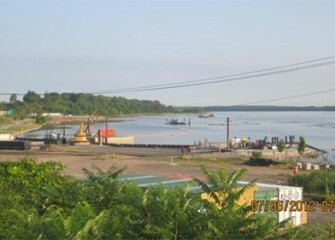 July 2012 - View of the shoreline dredging and capping support area. 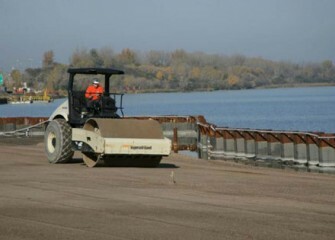 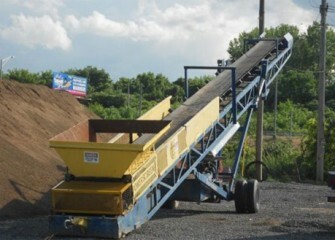 July 2012 - A weigh belt (conveyor belt with scale) is used to measure capping materials for the lake bottom. 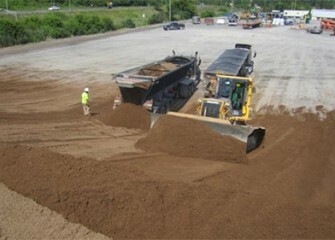 July 2012 - Weigh belt to measure sand before mixing with carbon. 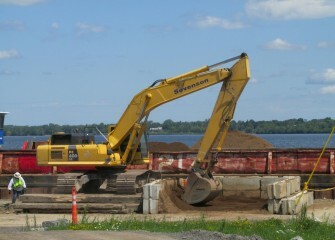 June 2012 - Upgrades to the lakeshore access road to support activities. 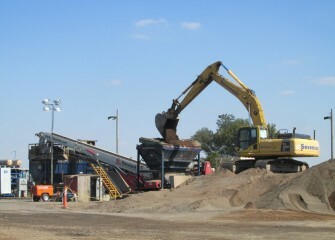 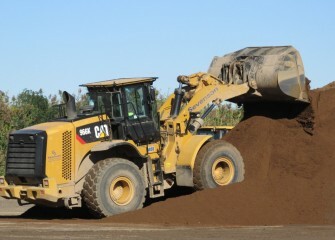 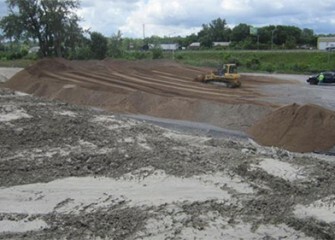 June 2012 - Capping material is stockpiled before operations begin. 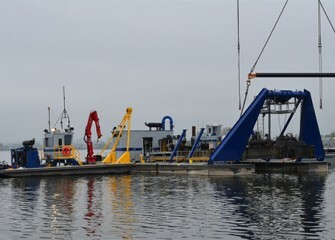 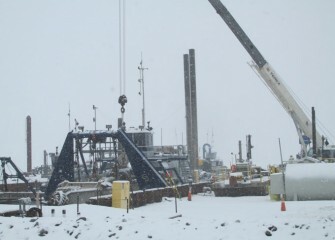 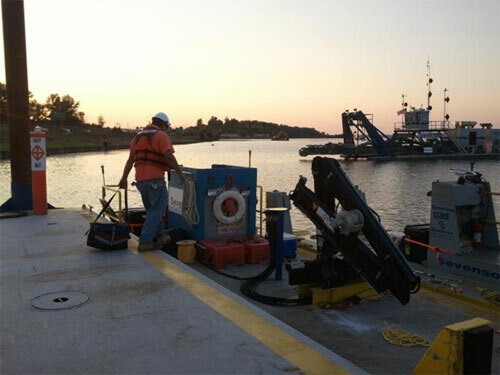 May 2012 - A support barge pushes the dredge into place to continue assembly. 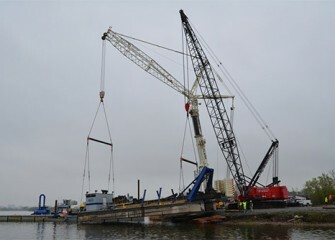 May 2012 - Two cranes safely place a dredge into the lake. 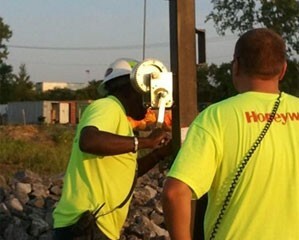 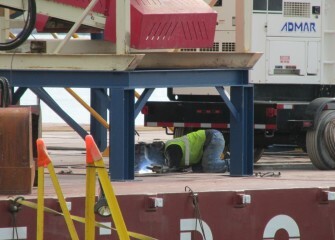 May 2012 - Health and safety team members monitor every aspect of the work. 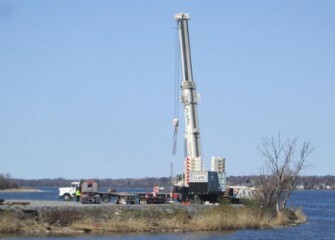 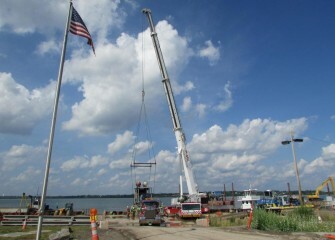 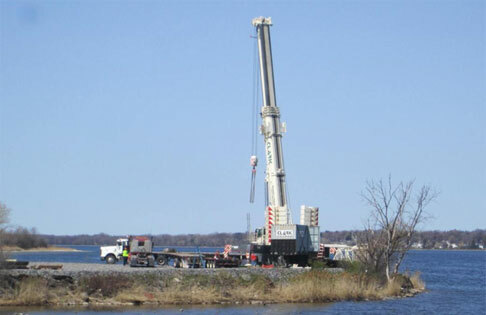 May 2012 - Cranes prepare to lift a dredge into the lake. 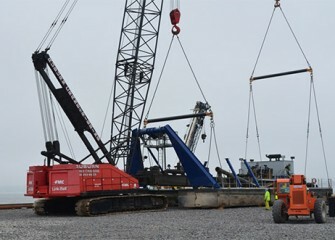 April 2012 - A 600-ton crane will aid in assembly of dredging equipment. 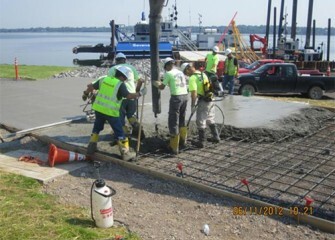 April 2012 - Concrete pad to hold equipment for lake operations. 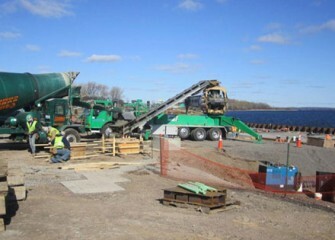 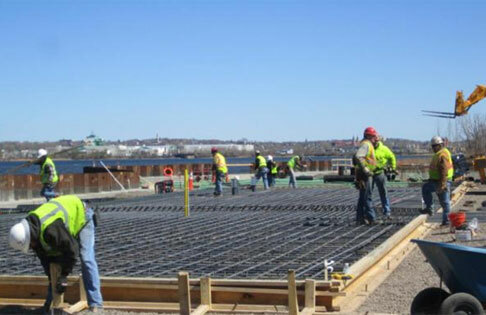 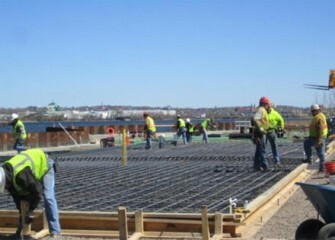 April 2012 - Workers pour concrete for concrete pad. 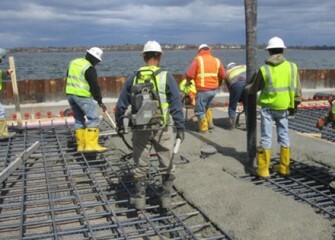 April 2012 - Skilled laborers build a frame for concrete. 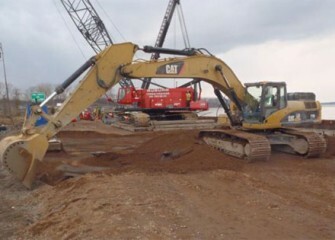 April 2012 - Clean dirt is placed over the groundwater collection system. 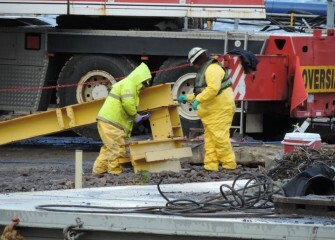 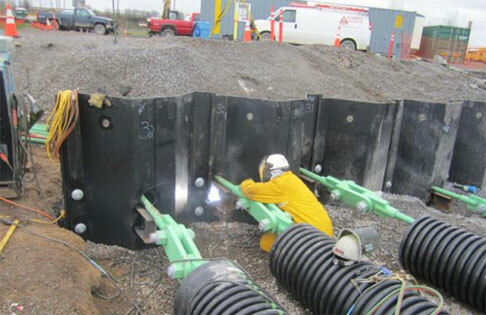 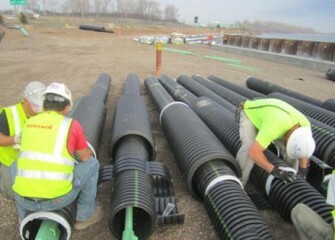 March 2012 - Workers prepare tension rods to support construction staging area. 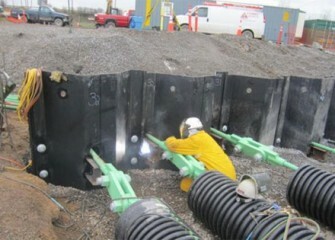 March 2012 - Worker connects tension rods to steel panels. 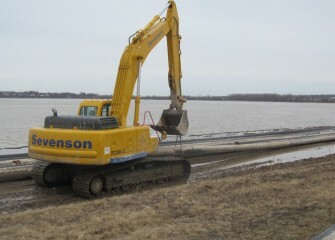 February 2012 - Preparing the shoreline area. 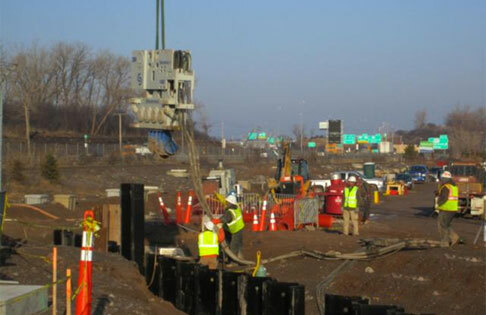 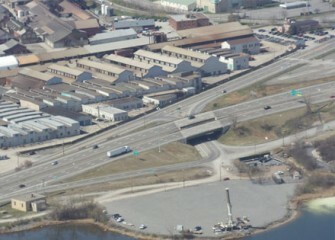 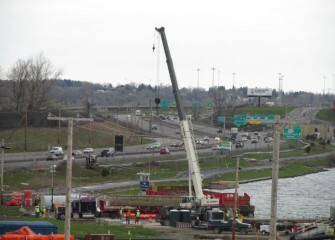 February 2012 - Lakeshore construction activities take place near I-690. 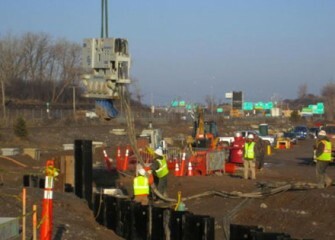 February 2012 - Workers install support structures behind the barrier wall. 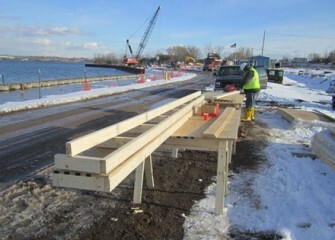 January 2012 - Lakeshore construction activities continue. 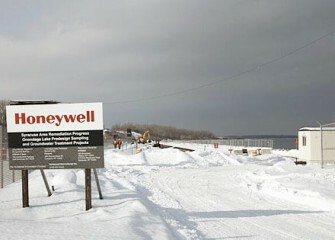 May 2011 - Steel panels are stacked on site before use. 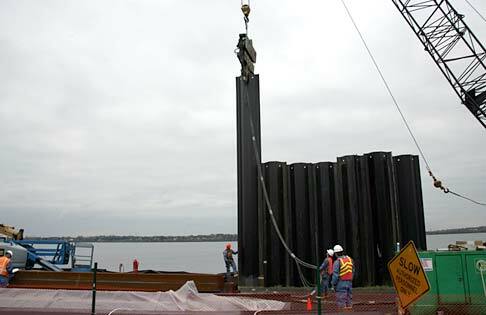 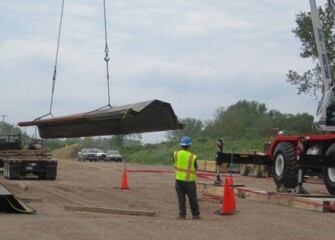 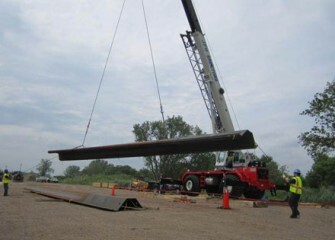 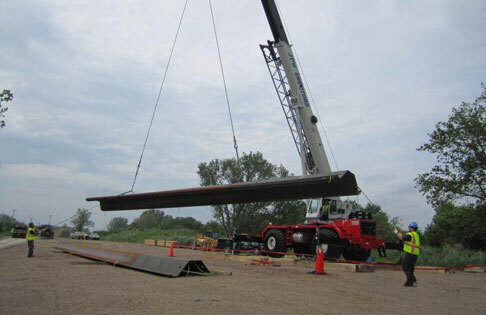 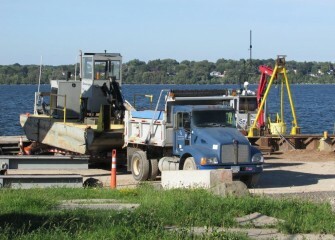 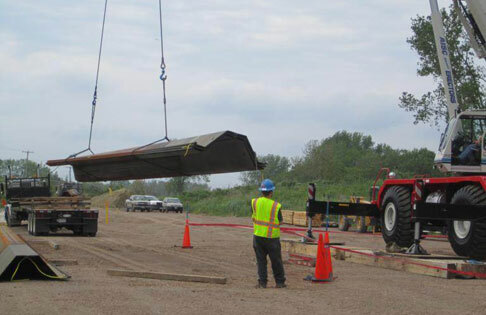 May 2011 - The first steel arrives to the shoreline to begin Phase III of the Barrier Wall. 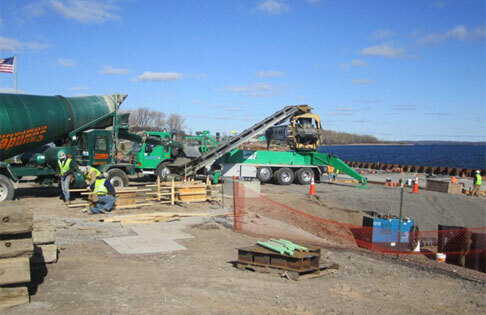 October 2009 - Grading work continues along the shoreline next to Phase II of the Barrier Wall. 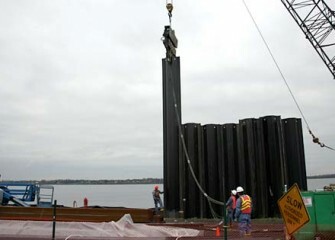 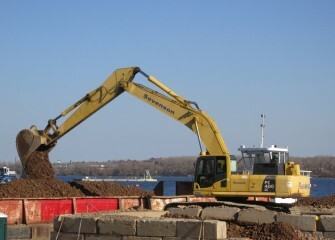 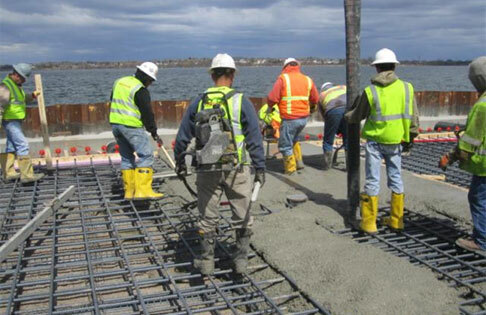 October 2009 - Worker compacts the shoreline along Phase II of the Barrier Wall.